Can you lose your double chin with this face mask? | Is This Mutton? It's an at-home skin lifting, firming and contouring face mask designed to do skin lifting, firming and contouring. 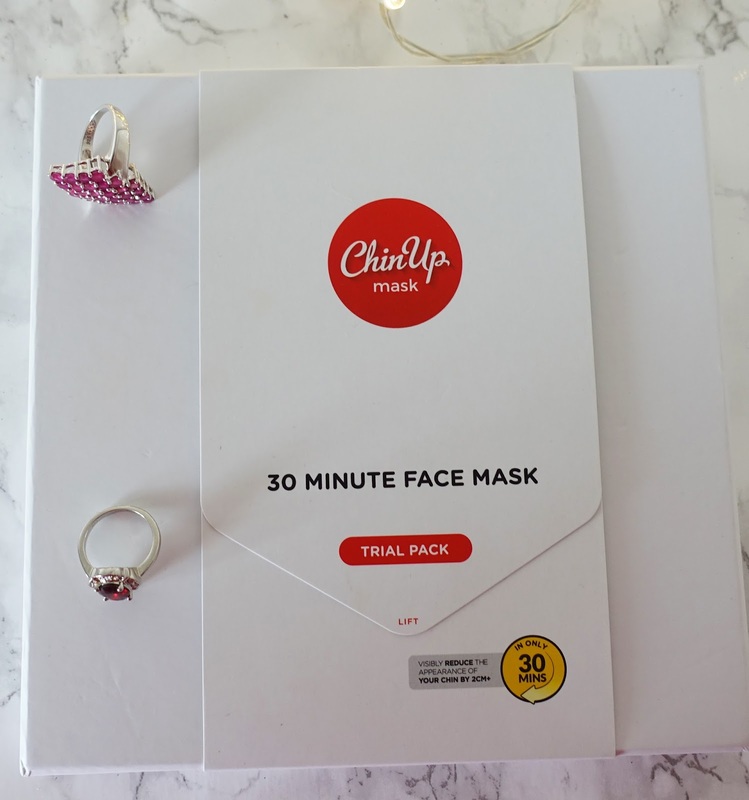 I was gifted a sample of ChinUp Mask and put it to the test. I don't have a double chin but I do have loose skin under the chin and I'm losing a bit of definition around the jaw line. So I was intrigued to see what the ChinUp Mask would achieve. 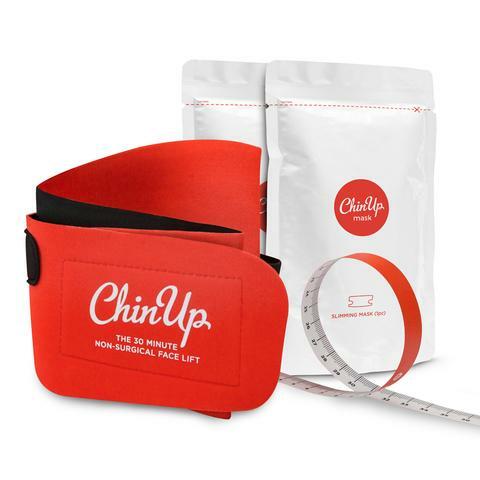 The trial pack contains two sachets of the mask, a measuring tape and a slimming band. First, you take two measurements: around the chin (from ear lobe to ear lobe), and then under the chin. You apply the mask, which is fairly liquid with no discernible scent, and fasten the slimming band. I took a photo of me wearing the band but the result was so appalling I couldn't share it. There was an immediate warming sensation as the ingredients got to work. What's in the ChinUp Mask? ChinUp Mask contains natural fruit extracts and 5 key active ingredients. The first is described as "Advanced skintronics technology" which has benefits including "converting fat into stabilised fibrous tissue" and "easing the edema under the cheeks, jaw and chin." I struggle a bit when brands invent a name - in this case a technology - and don't describe the precise scientific method. I'm not convinced a topical lotion and pressurised band can convert fat into stabilised fibrous tissue, although I reckon it's probably a similar effect to the contour wrap massages which claim to remove inches off your body. It's a compression effect where you lose water, not fat, but nonetheless, there's a short-term improvement. The other active ingredients are Q10, Vitamin E, Corum 9235 and hyaluronic acid. After 30 minutes I removed the band and mask. The mask had pretty much disappeared, not leaving any residue. I then took the measurements again. I was astonished to see I had lost 2cms from around the chin. My cheeks definitely had a bit of a sucked-in look. I hadn't lost anything under the chin, but the loose skin was definitely a bit tighter. The effect lasted two days. The manufacturers say you can expect to lose "2cms+." So if you're going to a special event, and pushing the boat out to look your best, you'll get a good result with the mask. The trial pack with 2 treatments is £29.95 and the Starter pack with 7 treatments is £49.95. Once you have the band, you only require the refill masks which are available in Refill Packs of 10 for £59.95. The website advises that the ingredients include Linalool, Butylphenyl, Methylpropional, d-Limonene, Ciral, Hexyl cinnamal. "These are rare allergens and we have not had any reported issues to date." Disclosure: I was gifted a trial pack of ChinUp Mask, but as always my views and opinions are objective. Sharing this post with Rena at Fine Whatever, Saturday Share at Not Dressed as Lamb. and weekend blog hop at Claire Justine. It definitely works for a short time so would be great for a party or wedding! Enjoy the rest of your weekend. Several years ago, a mommy at the school where I worked was selling contour wraps. I bought one but never used it. My neck may be beyond help after two surgeries and a rather long scar that have created less tone and more wobble!! In a perfect world, where I have won the Power Ball lottery, I might consider cold sculpting or something for my neck. But why stop there!? I need it all over. And that would be some lottery. I appreciate your honest review. Giggled a bit at your statement that you looked too appalling with the band in place to share a photo. Since I have 'known' you, you've only been beautiful and radiant with one amazing complexion. Even a chin band can't diminish that! Awww thanks Leslie! You're a sweetheart. My saggy neck is my nightmare! I would try this for sure, and like you say great for a special event Gail. I'm sure this gives one extra confidence when going somewhere special, or maybe for a wedding when lots of photos are taken. Feeling inspired ! !